5 mins How many drilling sites are left in the Permian? 24 hours "Undeniable" Shale Slowdown? Oil prices dived on Tuesday morning as expectations of an interest rate hike sent the U.S. dollar soaring, countering bullish news regarding the Iran nuclear deal. 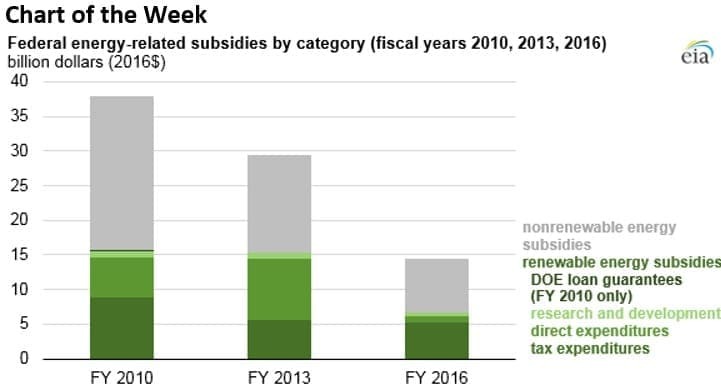 - U.S. federal subsidies for renewable energy, which includes biofuels as well as renewable electricity generation, has declined by 56 percent since 2013, dipping to $6.7 billion in 2016. - Renewable energy receives about 46 percent of total energy subsidies. - A great portion of the federal support in 2010 came from the American Recovery and Reinvestment Act of 2009, commonly referred to as the “stimulus” program following the financial crisis. • The U.S. EPA granted a biofuels waiver to the Carl Icahn-backed CVR Energy (NYSE: CVI), which will save the company tens of millions of dollars. The waivers have become a key source of contention between the ethanol and oil refining industries. The move also raises ethical questions because Icahn was an advisor to the Trump administration and is under investigation for his role in influencing biofuels policy. 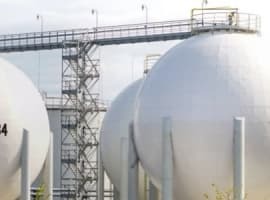 • Marathon Petroleum (NYSE: MPC) will purchase Andeavor (NYSE: ANDV) for more than $23 billion, which will transform Marathon into the largest refiner in the U.S., with a capacity of 3.1 million barrels per day. • BP (NYSE: BP) profits soared on higher production and higher oil prices. The 25 percent gain in oil prices in the first quarter compared to a year earlier helped BP report its best quarter in four years. Oil prices fell on Tuesday morning following a big spike on Monday. A U.S. withdrawal from the Iran deal appears to have been all but factored in to oil markets, allowing a soaring dollar to send oil prices tumbling back down. Trump admin issues 30-day waiver extension on steel tariffs. The Trump administration extended the waivers on steel and aluminum tariffs for the EU, Canada and Mexico for another 30 days. The exemptions were set to expire on Tuesday. The move suggests the White House is wary of retaliatory measures from key trading partners even as it wants to slow imports of steel and aluminum from them. Also, the U.S. government has a series of high-priority issues on the table – the Iran nuclear deal, North Korea negotiations, and a larger trade dispute with China – in which it needs allies. Saudi Arabia stands to gain from Iran sanctions. With the odds of U.S. sanctions on Iran rising as the May 12 deadline approaches, Saudi Arabia is positioned to benefit from the confrontation if Iranian oil is forced off of the market. Saudi Arabia has around 2.5 million barrels per day of spare capacity and could easily ramp up output to replace lost Iranian supply. "Saudi Arabia is not likely to sit on the sidelines and let things play out," Ellen Wald, president of Transversal Consulting and a non-resident scholar at the Arabia Foundation, told S&P Global Platts. "Saudi Arabia likes to present itself as the stable, reliable producer, always there to satisfy customer demands, and this is the perfect opportunity to step in." 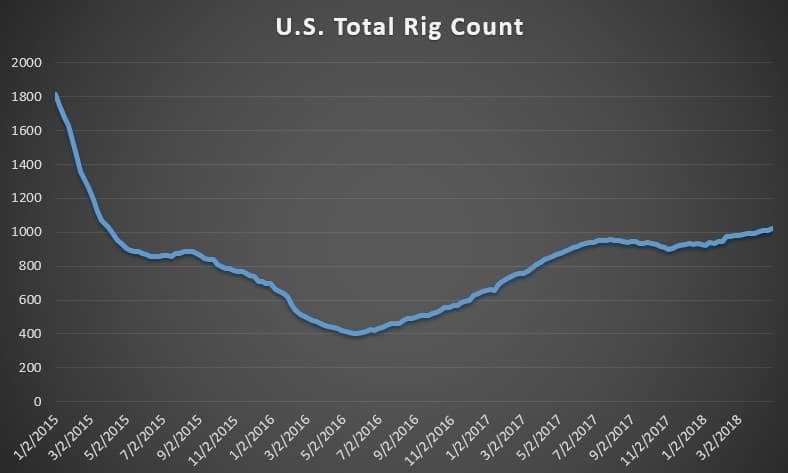 U.S. oil production jumps by 260,000 bpd in February. The EIA said that U.S. output surged by a massive 260,000 bpd in February, taking output up to 10.264 mb/d. The gains are consistent with the weekly estimates that have shown strong gains through April. The monthly estimates, published on a several-month lag, are more accurate but offer only a retrospective look at output. The latest figures show that shale drillers continued to post strong gains through February. BP’s shares jump on strong earnings. BP (NYSE: BP) earned $2.4 billion in the first quarter, up sharply from the $1.4 billion in earned a year earlier. The profits were the largest in years, a similar result for most of the oil majors for the quarter. BP’s production also increased by 6 percent. Chevron up, Exxon down. Chevron’s (NYSE: CVX) first quarter results were received well by Wall Street. The oil major is benefitting from higher production levels and restrained capex after years of high spending on its Australian LNG projects. ExxonMobil (NYSE: XOM) is in the opposite position, having to increase spending in order to rebuild its production base, which is a strategy that has fallen out of favor with investors. Exxon’s stock sank on the news. Russian oil exports to Europe decline as China buys up supply. Russian oil shipments to ports on the Baltic and Black Seas are set to decline by 19 percent in the first five months of 2018 compared to a year earlier, according to Bloomberg. At the same time, oil shipments via pipeline to China have surged by 43 percent. 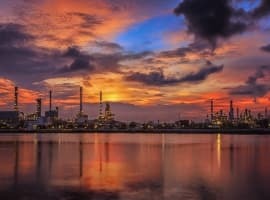 European refiners, in turn, will have to buy up more oil from the Middle East and the U.S.
Petrobras to add 500,000 bpd in 2019. Brazilian oil giant Petrobras said that it would add seven offshore platforms that will allow it to add 500,000 bpd of new supply by next year. EPA proposes freezing fuel economy standards, taking away California waiver. The U.S. EPA could soon propose freezing fuel economy standards for cars and light-duty trucks at 2020 levels through 2026, according to the LA Times, which would mean an average fleet at 42 miles per gallon through 2026 instead of 55 mpg. Also, the draft plan could try to take on California’s authority to set its own standards, a move that would be crucial to fully undermining the fuel economy standards set during the Obama administration. $300 oil? Pierre Andurand, a prominent hedge fund manager, said that the lack of upstream investment from the oil industry could result in oil prices skyrocketing to $300 per barrel within a few years. "So paradoxically these peak demand fears might bring the largest supply shock ever," he wrote on twitter. "If oil prices do not rise fast enough, $300 oil in a few years is not impossible." Grace period on Venezuelan debt expires. A grace period for Venezuelan debt from China has expired, which could lead to a spike in costs. Two years ago, China granted lax terms on $19 billion in debt to Venezuela. That grace period has now lapsed, according to Reuters, without renewal. The result could be the loss of $7 billion in annual revenue for Venezuela because it would result in an additional 305,000 bpd of oil earmarked for China. 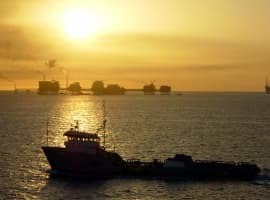 Venezuela can either decline to send that oil, essentially defaulting on the deal, or it can try to increase shipments to China, resulting in a massive loss of revenue.